It is with great pleasure that we invite you to “The Dawn of Western Painting in Japan” exhibition which we are soon holding at the Osaka Art Club, and will then travel to both Shihodo Galleries in Osaka and Tokyo. At this exhibition we will showcase Japanese artists who lived the early years of Western painting in Japan in the Meiji and Taisho eras. 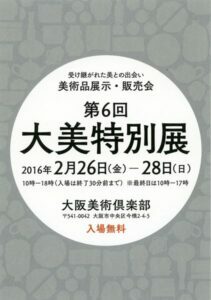 The exhibition at the Osaka Art Club will be held through February 26 to 29, 2016. We welcome you to visit us at Booth No.2-06 on the 2nd floor. The exhibition will then travel to the Shihodo Gallery Osaka from March 7 to 12, and finally to the Shihodo Gallery Ginza from March 16 to 23. We very much look forward to your presence.